The Hua Hin Market Village is the large shopping mall in Hua Hin and if you need to do some grocery shopping or just have a cheap lunch in the food hall then it is within walking distance of the Hilton Hua Hin, being an easy 1.3 km away. As most of the walk is alongside the main road there is not much of interest as you walk along, but you will get to see the small bars, some of the other hotels and a few small shops along the way. 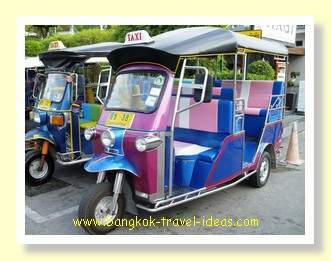 If you like you could take one of the small tuk tuks instead of walking. It took about 10-15 minutes to walk over to the Hua Hin Market Village. The Hua Hin Market Village is a great place to explore for little gifts and I had to buy a small Christmas gift to take back. After some searching I chose one of those unglazed earthenware pots for my friend back in Bangkok, similar to those you can buy on Koh Kred in Bangkok. I think that they are made of unfired red clay and just dried in the sun. The Hua Hin Market Village shopping mall was offering a gift wrapping service in the main part of the mall. Unfortunately they only had large or small boxes, but by judiciously stuffing the pottery into the small box the packing girls got it to fit. Luckily when the lid fell onto the counter it didn't shatter and the Christmas paper did its job in covering up all the black fingerprints that found their way onto the nice white box. Anyway once wrapped, with a little ribbon added it looked presentable. The box was more round than square, but it looked presentable - sort of. On the way back from the Hua Hin Market Village shopping mall we bought some fruit at a little roadside stall, to eat on the beachfront. Usually these street vendors are fairly friendly and if they are not too busy then they will often chat and they can be a great source of local information. It turned out that the lady was from Bangkok but had come down to Hua Hin to avoid the flooding. She also told us that she didn't operate dual pricing for locals and tourists, but that some food stalls did. Just opposite the Hilton Hotel was a small coffee shop advertising the use of the wireless internet for 20 Baht per hour and I thought I might come back later to check my emails. If you decide to walk to the Hua Hin Market Village then take your time in the heat. For most people the Hua Hin Market village will not be too far to walk. 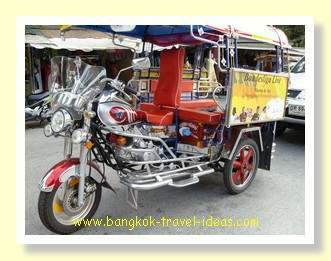 But once you have walked once then it is probably easier to take a tuk tuk, especially if you have children with you. After dropping the shopping in the room we went down and sat on the beach front. The weather had really cleared up, but there was still a strong sea breeze and the sea was still fairly rough. On an impulse I decided to get in the swimming pool. Strangely enough I had not seen that many people in the pool, just a few children and as soon as I jumped in I knew why. It was very cold, you know the sort of cold that children don't feel but adults do. It was a big shock to the system as I entered the water, but after about 30 seconds my body adjusted and stopped pumping blood to my extremities and made everything numb. I spent some time swimming around and found that certain parts of the pool were bearable and other parts were distinctly cold. Needless to say I didn't go back into the pool again for the rest of my stay. As night fell we ordered a couple of cocktails to drink as the sun went down, one Singapore Sling and one Mai Tai and just relaxed to the sound of the waves before going back to the room. In the evening we walked back to where I had seen the Chinese lanterns to see what they looked like in the dark. It was pretty hard to get a good photograph because of the amount of traffic, but I did my best. 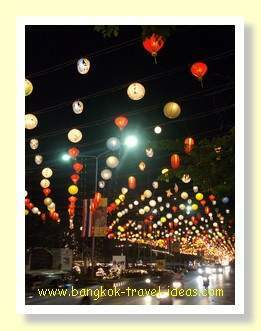 From this street, it was just a short walk over to the Hua Hin night market and we were there in no time. 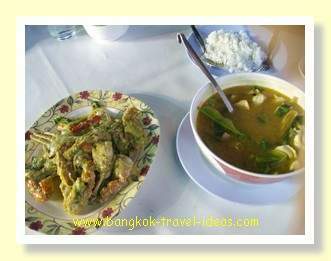 At the entrance to the market we stopped at one of the roadside restaurants and ordered Tom Yum Gai, fried prawns, a large crab and some rice and water. The food was freshly cooked and extremely hot when it arrived and cost 350 Baht. If you are on a budget then you will find that food is much more expensive on the beachfront or on one of the piers overlooking the ocean. Obviously you get to pay for the location and surroundings for those waterfront venues. Even though we had walked through the night market previously, I wanted to purchase one of those acrylic Buddha images and some cushion covers. I found a stall selling the Buddha images and the starting price for the negotiations was 350 Baht. 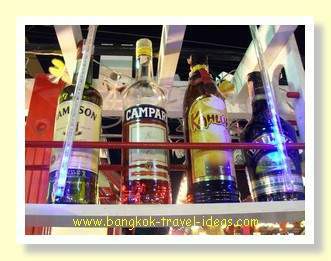 After a bit of discussion we agreed on 250 Baht and the deal was done. I had a plan to coat it with gold leaf at a later date to change its appearance. Here you can see what it looked like after I purchased some Thai gold leaf from e-Bay and applied it to the Buddha image. When I have completed this small craft project you will be able to read about it here. Although we had just eaten, the sight of a freshly cooked Roti was too much. I just had to have one. The Roti stalls are usually very popular with the tourists as half of the fun is watching how the Roti is made. They take a small amount of dough and then squash it flat and then with a spinning and tossing motion they make it paper thin. It is a little like how pizza bases are made, if you have ever seen that. Once the base is cooked they then wrap the ripe banana in it and heat a little longer before putting in a tray and drizzled with Carnation condensed milk. Roti's come with various toppings, but I like to have the one with banana. As luck would have it the Roti stand was just near to the cocktail stand, so two cocktails it was and I passed over the order for the banana roti. The bartender was still mixing cocktails to the sound of thumping beats and I wondered if he ever got tired. As the music tracks changed he would adjust the bass and treble to get just the perfect sound. Over the noise of the street market I couldn't really tell any difference, but he seemed to be having a good time. 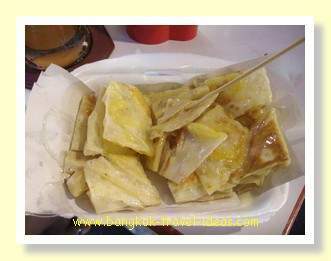 Soon the Roti appeared, it was piping hot and with a little stick to eat it with, magical - 40 Baht. All in all it had been a pretty good day, starting with the leisurely walk to the Hua Hin Market Village shopping centre and then a bit of relaxing and finally to top it off some great seafood and really cheap cocktails. If you are interested in staying at Hua Hin or Cha Am you can review this Agoda link to Hua Hin Hotels or you can read more of my Hua Hin holiday blog below. A holiday is meant for relaxing and it is good to have some time out and take it easy.Everything comes to an end and ultimately it means returning to Bangkok.